What are the most popular online bachelor's degrees offered in Ohio? Many colleges in Ohio are committed to providing an excellent online education to students. As one of the first states in the nation to adopt the Quality Matters assessment that attests to the quality of distance learning programs, Ohio is dedicated to ensuring that distance learners receive a robust online education. The Ohio System of Universities, the state's private colleges, and community and technical colleges all offer online degrees. The state also awards significant grant money to students to help defray the costs of a college education. Additionally, Ohio is a member of the Midwestern Higher Education Compact Initiative (MHEC). The MHEC works to ensure that students have affordable online education options, along with increased opportunities for academic success by allowing them to participate in member-university classes in schools from across the Midwest. It may be difficult for some students to obtain an on-campus college education. For working professionals, or people who cannot afford a traditional campus-based education, a distance program may be a palatable alternative. The online colleges in Ohio offer excellent academic opportunities, available to a wider spectrum of students. UC is a public research university that touts a student population of over 44,000 and one of the best online colleges in Ohio. As a public research institution, Cincinnati’s mission is to ready students for the workforce through education, real-world experience, and research. The university offers 74 online programs and certificates in graduate and undergraduate studies. Undergraduate certificates include Substance Abuse Counseling, Fire Investigation and Building Construction, and Medical Biller. Over 260 faculty members teach online in addition to their on-campus classes, and students have the option to attend full-time or part-time. Online students have full access to resources like academic advising, career placement, library resources, and technical support. The institution’s One Stop resource is a virtual hub where students can find answers to academic, financial aid, and scheduling questions they may have. One Stop includes school announcements and student records so students have access to anything they might need to help them succeed. Ohio State, located in Columbus, has been providing quality education for 144 years. U.S. News and World Report ranks the school as 16th in the nation among public universities, and number one in the state. The school has six campuses throughout Ohio in Lima, Mansfield, Marion, Newark, and Stone Lab; Ohio’s Agricultural Technical Institute in Wooster offers associate degrees in programs including environmental science. Ohio State offers bachelor’s programs in actuarial science, aeronautical and astronautical engineering, agricultural communication, and many others. The school has a 19:1 student-to-faculty ratio. Ohio State is the sixth highest U.S. Fulbright Scholar producer and the fourth highest producer of Peace Corp volunteers. Students can watch OSU’s top-ranked sports teams compete in football, baseball, and gymnastics. Learners can participate in sport clubs, outdoor recreation events, intramural sports, and more. Sport clubs include Aikido, archery, and badminton. Famous Ohio State alumni includes actor Patricia Heaton, golfer Jack Nicklaus, and retired football player Cris Carter. Ohio offers five associate’s degrees and seven bachelor’s degrees to students seeking an online degree. Bachelor’s degree options include Applied Communication, Criminal Justice, Customer Service, and RN to BSN. Students can complete the degree completely online and may have the option to attend classes at their local community college for credit toward a bachelor’s degree. The Athens, Ohio, campus boasts 17, 965 undergraduate students and an e-Learning enrollment of 5,978 students. Ohio’s online students are offered manys resources including academic advising, technological support through their email resource called CatMail, and learning support services including library access and the Academic Advancement Center. The eCampus Success Center provides distance learners with access to coaches that provide answers to questions regarding academic needs. Online learning at the school makes one of the best online colleges in Ohio. The school’s online courses are taught through OHIO Online. Located in Ohio, Ashland University is a Christian-affiliated institution that ranks among the best online colleges in Ohio. The university is a private liberal arts and sciences school that emphasizes the importance of each individual student. The school’s online offerings include associate, bachelor's, and master's programs. Undergraduates can pursue a degree in business, criminal justice, multidisciplinary studies, and communication studies. Ashland also offers an online RN-to-BSN program for aspiring nurses. The multidisciplinary studies program is well-suited for students interested in more than one field of study. Students can create their own individualized major by focusing on courses from two or three different subject areas. Each online course lasts seven weeks. Undergraduate applicants must submit a completed admissions application and prove a GPA of 2.25 or better. Toledo, one of 14 state universities in Ohio, is a student-centered, research institution, home to 23,000 students. The institution offers over 300 degree and certificate programs. Students can enroll full-time or part-time; The school accommodates student’s needs with day, evening, and online classes. Toledo has a Health Science Campus, which is home to the UT Medical Center. At UT Medical Center, graduate students in the medical concentration can learn in a classroom or residency setting and have access to the latest technology in the health field. UT has been offering one of Ohio’s best online colleges since 1998. Students have a choice between a host of degree programs at the associate, undergraduate, and graduate levels. Educators can earn endorsements for reading, preschool special needs, and transition to work. Online students have full access to library and tech support services, including access to scholarship and other financial aid that’s available. Findlay offers nearly 70 undergraduate and graduate degree programs to 4,000 plus students in a Christian-principle based setting. The campus, located in Findlay, Ohio, sits on 338 acres of space. The school has NCAA ranked teams in basketball, lacrosse, volleyball, swimming, and others. Findlay offers a selection of online programs for the distance learner. The online Ohio college programs are flexible, but still interactive and student focused. Each program promotes discussion and engagement among the student’s peers and professors. Students wanting to obtain a bachelor’s degree in business have the option to choose between four different program tracks: business management, emergency operations, environmental, safety and health, and health care management. There are several master’s degree options in the fields of business (including an MBA), education, health and technology. Included in Findlay’s online college is a Doctor of Education and Associate Degree in Positron Emission Tomography/ Computer Tomography. Findlays courses are offered 100% online. Mount Vernon Nazarene University is a private, Christian-based institution located in Mount Vernon, OH. Students can attend classes on the main campus, at one of the institution's several regional campuses, or online. MVNU offers bachelor's degree programs in business administration, leadership, ministry leadership, public administration, social work, education, and nursing. Master's degree programs include business administration, health care administration, management, education and ministry. MVNU offers two Masters of Ministry: the base masters program, and a Master's of Ministry plus an MBA. MVNU's MBA program is a 12-course curriculum that covers areas of study in accounting, leadership, finance, and other business subjects. For undergraduate programs, the school accepts particular work experience, military experience, prior attendance at seminars, and other personal/professional experiences as class credit. Doing so allows students to obtain their degree faster and with less educational expenses. Wright State, located in Celina, Ohio, was named for aviation extraordinaires, the Wright brothers. The institution is home to almost 18,000 students and offers over 230 degree programs. Wright State University has historically been a popular campaign stop for presidential candidates. Among several online master’s offerings, Wright State University offers an online bachelor’s degree, the RN-BSN Nursing Degree Completion. The program is designed for nurses who would like to further their career and are seeking to complete a bachelor’s degree in nursing. The program requires 30 credit hours and can be completed in just 15 months if the student attends full-time. A doctoral and master’s program in nursing is available online. Distance learners can tailor the program hours around their busy schedules and are not required to attend full time. The program is not approved in multiple states, including California, New York, and Florida. Kent State, located in Kent, OH, originally opened as a teacher-training school in 1910. Kent has become a popular Ohio institution with over 30,000 students and 2,600 faculty. Kent State focuses on the student experience and strives to keep its class sizes small so students stay engaged in the learning process. The university has several campuses, 8 of which are in Ohio. The institution offers a total of 30 degree and certificate programs to distance learners, and they’ve provided online education for the past 15 years. The school’s large, international community is an enticing element for online students to consider when choosing a school. Distance learners are provided access to Blackboard, the school’s chosen online platform where all coursework is completed. Online students have access to amenities like career services, a school-specific email account, library access and tutorials, and a 24/7 helpdesk. A public university located in Ohio, Miami University enrolls nearly 19,000 students annually across 120 bachelor’s programs and more than 60 master’s and doctoral degrees. One of the top online schools in Ohio, the university offers an eLearning program to students interested in taking their courses online. The school generally delivers its courses asynchronously through the Canvas platform, so students can complete their coursework at any time, although certain courses may have synchronous components. Students do not have to attend Miami in order to be eligible to take eLearning courses. The university’s online courses are open to students at other universities as long as they are in good academic standing. The courses feature online conferences and in-depth instructor feedback on assignments and test scores. While full bachelor’s degrees are not available entirely online, the school does offer certain undergraduate courses online, in addition to several online and hybrid graduate programs and certificates. Bowling Green State, located in Bowling Green, Ohio, awards approximately $25 million in scholarships every year and boasts a diverse student population. The institution offers accelerated, fully-accredited online colleges in Ohio with a rolling enrollment so students can start whenever they are ready. eCampus students are assigned to an advisor who is tasked with ensuring they have what they need to complete an online degree. Their new, accelerated 8-week programs are designed for the student with a busy schedule who’s trying to complete a degree. These 8-week programs allow students to finish sooner, which makes the program more affordable. BGU bachelor’s programs include Allied Health, Business Administration, and Learning Design and Technology. Bowling Green has an online resource library dedicated to distance learners, which serves as a one-stop location for FAQs, research assistance, online articles, journals, books, and other library services. Bowling Green’s programs are taught 100% online. Northwestern Ohio, situated on 200 acres, is known for its academic programs in automotive, diesel, and high performance. In addition to its 60 on-campus program offerings, Northwestern Ohio provides access to 10 online programs, including a 100 percent online MBA program. Northwestern’s online MBA does not require students to submit GMAT scoring, and the class size is capped at 20 students, ensuring attention from the professor. Other programs include accounting, office management, and health information technology. Distance learners can take classes at their pace and complete degrees in everything from marketing to business management and health information technology. Students have full access to 24/7 technical support, career services and advising as well as library resources, which are abundant as the university is a research institution. An accumulative GPA of 3.0 is recommended by the school for online students. Youngstown State is situated halfway between Cleveland, OH and Pittsburgh, PA, giving students access to two well-known cities. The institution is home to over 12,000 students and boasts a 16:1 student-faculty ratio. Youngstown is one of the best online colleges in Ohio with four bachelor’s degrees and six master’s. All of the online bachelor’s program offerings are geared toward the medical field. Distance learners have a choice between public health, nursing, and respiratory care as majors. Nearly 1,500 adult learners choose Youngstown for distance learning every year. Master’s program include Respiratory Care, Health and Human Services, and multiple criminal justice options. Distance learners have access to an array of student support services like writing and math tutoring, disability services, and degree progress support. Students who qualify can get the GMAT/GRE requirement waived prior to entering the school’s MBA program. The University of Dayton is the largest private university in Ohio. The institution is located in southwest Ohio. University of Dayton’s philosophy is learning by doing, which is exemplified by their commitment to reducing their communities carbon footprint, staying active in the global community by opening campuses across the world, and conducting groundbreaking research. Dayton’s school of education and health sciences department offer a variety of online degrees geared toward education professionals. Students from the education career field looking to gain advanced skills have the option to complete a master of science degree in education leadership. Distance learners looking for certificate or degree programs for non-licensure teaching positions have many options. Students are able to complete their degrees entirely online at this online Ohio college, but it is not required. Students have the option to choose a blended format, where they attend some classes on campus. Malone, a private Christian college in Canton, Ohio, offers 41 majors and 11 graduate degree programs along with many minors programs. The institution believes in a well-rounded, liberal arts education. Each degree path includes Bible-focused study, engagement, and conversation. The Northeast Ohio institution is situated on 96 acres and touts a student population of just under 2000. Affordability is important to Malone University, and 100 percent of students who are able to meet the minimum requirements for enrollment receive some form of financial assistance. The institution offers three online degree programs: bachelor’s level studies in business management and master’s level studies in business administration and organizational leadership. All Ohio online college offerings at this institution are available in an accelerated format so students can earn their degrees sooner, and at a lower cost. Distance learners will receive access to Malone’s online library databases and catalogs. Located in North Canton, Walsh University is a Catholic university and is among the top online colleges in Ohio. In addition to the school's 136-acre main campus, Walsh has a satellite campus in Akron and a global learning campus just outside of Rome, Italy. The university boasts a diverse student body, with students from 40 different states and 40 different countries. The school's online bachelor's programs include business administration, organizational development and leadership, communications, and a build your own major option which allows students to select up to three disciplines of study. The university also offers an MAEd, MSN, and DNP online. Walsh delivers its online courses asynchronously so students can complete their coursework when it's convenient for them, making their degree as flexible as possible. The school delivers its courses in an accelerated format, with two eight-week sessions per semester. Applicants must provide a completed application, high school transcripts, ACT or SAT scores, and an essay. Cleveland State, located in the heart of Cleveland, OH, serves 17,000 students and offers over 200 programs of study. The institution follows a philosophy of engaged learning, which is cultivated in the classroom and out in the community. CSU offers five undergraduate and 12 graduate degrees online through their Ohio online college. The institution’s eLearning center has been providing online education to distance learners for more than 10 years and offers around 250 courses each semester, giving students a wide range to choose from. Distance learners are provided with the same resources as on-campus students with access to 24-hour technical support and academic success resources such as tutoring, advising, and online library access. Undergraduate programs include RN to BSN, business administration, and Chemical Dependency Counselor Assistant. The online college has an accelerated MBA and a Bioethics Certificate (also offered to undergraduates). Franklin, located in Columbus, Ohio, was founded in 1902 and caters its educational experience toward the busy lives of adult students. Students have the option to complete their degrees on campus or online. Students have access to one-night-per-week classes, which are offered at many university campuses in the mid-west region. The institution offers several online degree options, all of which are tailored to workforce readiness. Programs include Allied Healthcare Management, Emergency management and Homeland Security, and Operations and Supply Chain Management. Franklin offers online master’s and doctoral programs in Healthcare and business administration. Franklin University accepts more transfer credits than many other institutions, which makes it easier to graduate in a timely manner and makes the degree more affordable. The programs are student-focused and distance learners are eligible for financial aid. Students have access to advisors to help them determine the best route for their online education. Ohio Christian University provides affordable, accredited degrees. Applicants to associate programs must have a high school diploma or GED. Bachelor's program applicants must have a minimum of 50 semester credits from an accredited school and a minimum 2.0 GPA. The institution offers a set of flexible options to accommodate busy schedules, including online, hybrid, and on-campus programs. Ohio Christian University's online associate, bachelor's, and master's degrees are available in an accelerated format. Students can complete online programs in business, information technology, English, human services, political science, ministry, nursing, and substance abuse counseling. All programs are eligible for financial aid and employer reimbursement. Ohio Christian University is a military-friendly institution, providing support for both military personnel and their spouses. Academic scholarships are available. Union Institute is committed to meeting the needs of adult learners, which is done through its on-campus and online colleges in Ohio. The school has over its 50 years of history and has continuously evaluated and refined its practices to ensure it meets the needs of its students. In addition to its Cincinnati location, Union Institute has campuses in Florida, California, and Vermont. The institution focuses on six core values: academic excellence, creative and critical thinking, theory and practice, social justice, diversity, and integrity. Union Institute offers online bachelor’s degrees in four majors: business, education, health, and civil service; 13 programs are offered from elementary education to psychology. Each major is flexible in schedule to accommodate the distance learner’s busy lifestyle, and students have full faculty support and collaboration through every step. Classes are offered every eight weeks so students can enroll at throughout the year. Online students are eligible for financial aid through scholarships and loans. Akron, a well-known public research institution, offers over 300 programs of study and is home to over 23,000 students. It’s size is equal to its resources. The institution offers state-of-the-art technology, robust athletics programs, and extensive library resources. Online students receive access to tutoring, career services, UA Adult Focus, advising, and library access. The Adult Focus program helps learners, age 25 and up, with preadmission advising, finding scholarship opportunities, and teaches a special class that helps adult students learn valuable skills for success. For veterans there’s the Military Services Center, they’ll help apply for UA and find scholarships. Online students start with a computer-based orientation to get familiar with the layout. Among online bachelor’s, master’s, and certificate programs, Akron offers a RN to BSN bachelor’s program. To ensure the best educational experience possible, online students receive one-on-one attention from instructors and have an advisor to guide them through their educational journey. Tiffin, located in northern Ohio, is home to a small but vibrant community that is continuously growing. The institution offers a variety of degree programs, which can be completed on campus, online, or through a hybrid format. The school is home to over 4.200 students and 400 faculty. Students have access to the library on campus, which is a member of OhioLink, giving students access to 90 other libraries across the region. Students have access to four online bachelor’s degree concentrations: a Bachelor of Arts, a Bachelor of Business Administration, a Bachelor of Criminology, and a Bachelor of Science. Students can choose a specific track like professional studies or accounting. This online college in Ohio can be completed exclusively online, or students can choose to attend classes on campus one day per week. The school offers a certificate program in Arabic studies. The program teaches students the language and culture; it commonly leads to jobs in the government. Hiram strives to be known as an eclectic, energized liberal arts college. The small campus is designed to foster individuality and critical thinking through hands-on learning. The student body is small, at just 875 students, but 99 percent of those students receive some type of financial aid. The college touts 81 full-time faculty members, which makes it possible to offer a 10:1 student-teacher ratio. It offers one of Ohio’s online programs to accommodate adult learners. Hiram offers a bachelor’s degree in business management, accounting, and financial management. Programs offer the flexibility adult learners need and one-on-one attention from faculty and staff when necessary. Students can expect a high level education with an abundance of resources including a help desk, technical support, and research resources. Hiram offers six start times throughout the year and accepts 75 hours of eligible transfer credit. Owned by the Kettering Medical Center, Kettering College offers an array of certificates and degrees in the medical sciences in a technologically advanced medical setting. The school is chartered by the Seventh-day Adventist Church and is home to 700 students. Kettering offers online completion programs in five medical areas: Respiratory Care, Management, Education, Sonography, and Advanced Imaging. To be qualified for admission, students must possess an associate’s degree, be enrolled in their second year of a health sciences major, and be in good standing at their current institution. The degree programs can be taken entirely online or in a hybrid format. Students can choose full-time or part-time status. More traditional liberal arts programs include business management, business administration, and social work. Students have up to seven years to complete their degrees and have full access to textbooks and tutoring services. Mount Saint Joseph, located in Cincinnati, Ohio, is a small, vibrant private university dedicated to student success. The institution is focused on high-quality academics in a setting where students have access to hands-on learning experiences. The institution is also dedicated to service; students on-campus participate in some kind of service learning experience. With an 11:1 student to faculty ratio, students are assured one-on-one attention, which provides a personalized learning experience. The personalized attention translates to their online programs, which are taught by full-time faculty members. The institution offers an online RN to BSN, several certificate programs, and a Master of Arts in Reading Science. The online programs are designed with adult learners in mind, and provide flexible schedules at an affordable rate. Certificate programs include Gerontology, Chemical Dependency Counseling, and Dyslexia. Mount Saint Joseph’s online programs are not authorized in all states. If you want to qualify for a range of high-paying job opportunities, earning a college degree is key. When deciding where and what you want to study, you may end up weighing both in-state and out-of-state schools. If you are from Ohio, there are many advantages to attending college in your home state. Sticking close to home can qualify you for in-state tuition and help you build a network of regional professional contacts. You may also benefit from your school's name recognition on the local job market, and you'll be relatively close by if you need to occasionally visit campus. When researching programs, be sure to consider our list of the most affordable online colleges in Ohio. All of the schools in this list are accredited, and our rankings highlight the colleges that offer the best blend of affordable tuition and return on investment. Located in Columbus, Ohio State is one of the largest colleges in Ohio. The university’s online programs are taught both synchronously and asynchronously by the same faculty who teach on campus. The school offers distance learning courses that are fully online, as well as distance enhanced courses that are 75-99% online. Students who are not residents of Ohio only pay $5 more than state residents. Distance learning students are required to pay a surcharge. Undergraduate applicants should submit ACT or SAT scores and high school transcripts. Ohio State also offers a generous transfer policy; one-third of its undergraduates are transfer students. Kettering is a small Christian college that specializes in healthcare. The school offers associate, bachelor’s, and master’s degrees, as well as certificates in nursing, biology, occupational therapy, radiologic sciences, sonography, and many other fields. As one of the most affordable online colleges in Ohio, Kettering offers most of its programs in online formats with part-time and full-time options. Many of the school’s degrees, including its degree completion program in health sciences, feature courses that are fully online and do not require additional clinical hours. Other programs, such as its bachelor of science in biology, include online course options but also require students to complete on-campus coursework. Located in Cincinnati, Mount Saint Joseph University offers its students extensive opportunities for professional experiences. MSJU’s flexible online learning programs include an RN to BSN nursing program, a master’s degree in reading science, and specialized certificates and endorsements, including a gerontology certificate. The school’s online programs utilize both asynchronous and synchronous learning styles. Applicants should submit SAT or ACT scores, letters of recommendation, and high school transcripts. Students can also transfer up to 90 credits from a regionally accredited institution. As one of the most affordable Ohio universities, MSJU provides its students with multiple opportunities to earn grants, scholarships, loans, and work-study. With over 17,000 students, Cleveland State University is a large urban university that serves a diverse population. Students can choose from over 250 eLearning courses each semester in order to earn bachelor’s and master’s degrees, as well as online certifications. These online degree programs involve both synchronous and asynchronous learning. A few programs, such as the master of science in nursing, require students to participate in online classes and onsite clinical hours. CSU also offers blended programs that integrate online and on-campus coursework. Prospective students must have a minimum GPA of 2.3 and satisfactory ACT or SAT scores. Founded in 1872, the University of Toledo is a public research university. The school’s expansive selection of over 30 online programs includes associate, bachelor’s, master’s, and doctoral degrees, as well as endorsements and certifications. UT offers a wide variety of online formats; students can take asynchronous or synchronous classes in part-time, full-time, fully online, or blended formats. Additionally, distance learners who are enrolled in online programs qualify for in-state tuition. UT’s generous scholarship opportunities and awards for its in-state, out-of-state, nontraditional, and transfer students make it one of the most affordable Ohio universities. A Christian university, the University of Dayton’s focus on financial aid makes it one of the most affordable online colleges in Ohio. Around 94% of the school’s first-year students receive some form of financial aid, and the school spends about $162 million per year on scholarships. UD also does not charge surcharges or additional fees. The school raises scholarships and grants each year to compensate for increases in tuition. The university offers online programs through its school of education and health sciences. Online programs include a bachelor of science in education in early childhood leadership and advocacy, principal and superintendent licensure, and a master of science in education in educational leadership. Named after the Wright Brothers, Wright State University has a long history of valuing both innovation and affordability. As one of the most affordable online colleges in Ohio, it offers many of its first year students merit scholarships ranging from $500 to $20,000. During the 2017-2018 academic year, Wright State awarded more than 2,000 first-year students a collective $10 million. The school’s online bachelor’s, master’s, and doctoral degrees include fully online programs such as its master of business administration and RN-BSN completion program. The university also offers blended programs, such as its master of science in logistics and supply chain management, which involves online coursework and four on-campus residencies. Union has aimed to meet the needs of nontraditional students since 1964. Today, the college offers online and blended programs to help students earn bachelor’s, master’s and doctoral degrees while maintaining work, family, and community responsibilities. In many of these programs, students can choose part-time or full-time schedules. Union also allows students to receive credit for relevant work experience and to easily transfer previous college credits. A few of the college’s programs require students to complete clinical hours, in-person meetings with their peers and advisers, or other on-campus work in addition to online coursework. Union offers several undergraduate and graduate scholarships and fellowships. Mount Vernon Nazarene University focuses on professional studies and Christian ministry. Around 98% of its undergraduate students and 62% of its graduate students receive financial aid in the form of scholarships, loans, and work-study opportunities. MVNU’s online programs include bachelor’s degrees in business administration, early childhood education, and ministry leadership, as well as master’s degrees in management and ministry. MVNU does not have an application fee and its graduate programs do not require students to take the GRE or GMAT. MVNU also maintains a dual enrollment program that allows students to save time and money by earning college credit while still in high school. The University of Northwestern Ohio specializes in applied technologies, business, and health and occupational professions. This private university offers 10 fully online bachelor’s degrees and 11 associate degrees through its online learning programs. All of UNOH’s courses are taught asynchronously. Some of the school’s notable online programs include an associate in travel and hotel management, a bachelor’s in forensic accounting, and a master of business administration. The MBA program does not require students to take the GMAT, although it does offer credit to students who received at least a 500 on the exam. Undergraduate students are not required to take the SAT or ACT. Home to 3,800 students, Findlay is a Christian university that offers a wide variety of degrees, including programs in science, health, animal science, and equestrian studies. Findlay was one of the first colleges in Ohio to offer online courses. Today, the university expresses this commitment to helping traditional and nontraditional students succeed through its customized financial aid plans and scholarships; 99% of the university’s students receive financial aid. Findlay also focuses on helping its students find internships in their fields. Students can choose from associate, bachelor’s, and master’s degrees in fields like health informatics, professional communication, and education. Franklin primarily serves working nontraditional learners. While its main campus is in Columbus, the university also maintains campuses across the Midwest and offers all of its degree programs online in addition to on campus. The school’s commitment to financial aid, low tuition rates, and flexible educational options make it one of the most affordable Ohio universities. The school’s extensive online learning programs include bachelor’s, master’s, and doctoral degrees in entrepreneurship, psychology, and healthcare management. To meet students’ career and learning needs, Franklin offers both synchronous and asynchronous classes in fully online and hybrid formats. Bowling Green State University serves over 19,000 students and awards over $25 million in scholarships each year. As one of the most affordable online colleges in Ohio, the school’s website features several convenient financial aid tools to help students find scholarships, grants, fellowships, and work-study opportunities. The university’s distance learning programs are offered fully online or in blended formats, with each class lasting eight weeks. Courses in fully online programs are taught asynchronously, while hybrid classes usually involve a few in-person meetings. Some of the school’s notable programs include its master’s degree in special education and autism spectrum disorders and its master’s degree in food and nutrition. Chartered in 1809, Miami University is one of the oldest public universities in the country. Despite the fact that the college is over 200 years old, Miami has embraced 21st century technology with its eLearning programs in order to create flexible education options for busy students. The university’s online programs are taught primarily asynchronously, though some programs require occasional face-to-face meetings or presentations. Miami offers individual undergraduate classes, master’s degrees, and certificates online; notable programs include a low-residency MFA in creative writing and a global field program in biology. Miami guarantees that tuition and costs for room and board will be remain the same for each undergraduate student’s four years at the school. Located in Canton, Malone University is a Christian school that emphasizes professional skills and Christian history and theology. The college’s online programs include a master of arts in organizational leadership, a master of business administration, a bachelor of arts in social work, and a degree completion program in organizational management. All of Malone’s online programs utilize asynchronous learning formats. Online classes use tools such as discussion boards to facilitate communication between students, peers, and instructors. Malone also offers several scholarships, fellowships, and work-study opportunities, including a creative writing fellowship and a transfer scholarship. Over 90% of its students receive financial aid. Chartered in 1817, the University of Cincinnati is one of the oldest colleges in Ohio. This research university features a sprawling urban campus. The school offers multiple internships, study abroad programs, and online learning opportunities. UC’s online learning programs include nearly 100 degrees in nursing, criminal justice, education, business, and information technology. UC also offers massive open online courses (MOOCs), which allow students from all over the world to learn online at little to no cost. Undergraduate applicants should submit high school transcripts, letters of recommendation, and ACT or SAT scores. Transfer students must earn at least 30 semester hours at UC. Located in Athens, Ohio University serves around 36,867 students, 8,242 of which are online students. The university’s eCampus features degrees in customer service, psychology, English, economics, and other fields. Many of these programs are available fully online, although the master’s programs in business administration, athletic administration, and coaching education require two to three days of in-person coursework and meetings. Except for the master of information and telecommunication systems, most of Ohio’s online programs are taught asynchronously. Ohio also offers blended programs, including a master of science in nursing. The school accepts transfer credits from other institutions. Students may be granted credit for previous military or work experience. Not to be confused with the University of Notre Dame in Indiana, Notre Dame College is a small liberal arts school in Cleveland that has a reputation of its own. In order to provide students with an affordable, flexible education, the college offers online programs in nursing, criminal justice, education, business, psychology, and national security and intelligence studies. These programs feature fully online and blended coursework. This school also offers a generous transfer policy; while students only need to take at least 32 credits through NDC. Muskingum has long been one of the most affordable colleges in Ohio. In 1996, responding to nationwide concerns over rising college costs, the university lowered its tuition by $4,000. This small college of nearly 4,000 students offers several online programs through its school of graduate and continuing studies. Muskingum’s online degrees include a master of information strategy, systems, and technology and a master of arts in education. The school also offers educational leadership programs, including principal and superintendent licensure. Online classes are offered on part-time and full-time schedules in fully online and blended formats. Graduate students can transfer up to nine credit hours for classes in which they earned at least a B. Founded by the YMCA in 1908, Youngstown State University awards its students over $8 million in scholarships each year. Today the school serves around 12,000 students through its downtown campus and its distance learning resource. YSU’s online programs include bachelor’s degrees in public health, nursing, and criminal justice and master’s degrees in business administration, financial economics, and engineering. These online programs are taught through fully online, hybrid, and video conferencing formats. Undergraduate applicants must have a minimum 2.0 GPA. Applicants must submit high school transcripts and ACT and SAT scores. Graduate students must submit college transcripts and, depending on their program, test scores from the GRE or GMAT. Hiram is a small liberal arts college of about 875 students. The school’s status as one of the best colleges in Ohio for low tuition largely comes from its tuition guarantee program, which ensures that tuition does not increase annually. Additionally, 99% of the school’s students receive financial aid. The school offers two fully online degree programs in accounting and business management. These programs rely on both synchronous and asynchronous learning methods, including online discussion forums and scheduled chat and video conferences. Hiram allows its students to complete their degrees quickly through an accelerated three-year degree program. Ohio Christian University has campuses in Ohio and Georgia, as well as online. The online campus offers associate, bachelor’s, and master’s degrees in nursing, business, substance abuse counseling, psychology, leadership and ministry, and many other fields. Online classes are taught in an asynchronous, cohort-based format; students enroll in one course at a time and begin and end each course alongside a group of their peers. OCU offers a military tuition discount and employer reimbursement programs. Incoming undergraduates must have a minimum 2.0 GPA, while incoming graduate students must have a minimum 2.5 GPA. The first college in the state to offer degree completion programs, Urbana University has a long history of providing flexible education options for its students. Although Urbana is an official branch of Franklin University, it offers an on-campus and online culture of its own. This school is known for its focus on sustainability. Online programs include sustainability management, information systems, nursing, business with an emphasis in health, and education. Most coursework is taught asynchronously. Both freshman and transfer students must submit ACT and SAT scores. Graduate students must submit letters of recommendation. As one of the largest universities in the country, Kent State University is best known for its research community and its expansive network of onsite and online campuses. The school’s online campus allows busy students to choose from over 30 bachelor’s, master’s, and doctoral degrees, which include one of the only master’s degrees in the country for user experience design. Kent State also offers several online certificates, including behavior intervention and health informatics. Online courses may be synchronous or asynchronous. Transfer students should have a minimum GPA of 2.0 and submit ACT or SAT scores along with college transcripts. The University of Akron serves over 22,000 students in over 300 areas of study. The university’s online programs focus on maintaining high levels of student-faculty interaction in a flexible educational environment. Students can choose from eight online degree and certificate programs, including master’s degrees in taxation and speech-language pathology. In order to maintain its status as one of the most affordable online colleges in Ohio, Akron provides over $17 million in scholarships. The Akron Advantage Award Program offers scholarships to non-Ohio residents to help cover out-of-state tuition. Undergraduate applicants are automatically considered for Akron’s many scholarships and most graduate applicants can apply for assistantships and fellowships. There are 154 different schools in Ohio that offer online degrees. These schools encompass a variety of types and profiles: some schools feature several different programs entirely online, while others have one or two such programs. Some charge online students the same tuition as residential students; many offer a reduced price. You can find specialty programs, religious schools, master's degrees and doctoral programs, all online through an Ohio-based college or university. About 10% of postsecondary students in Ohio are enrolled in exclusively online programs. 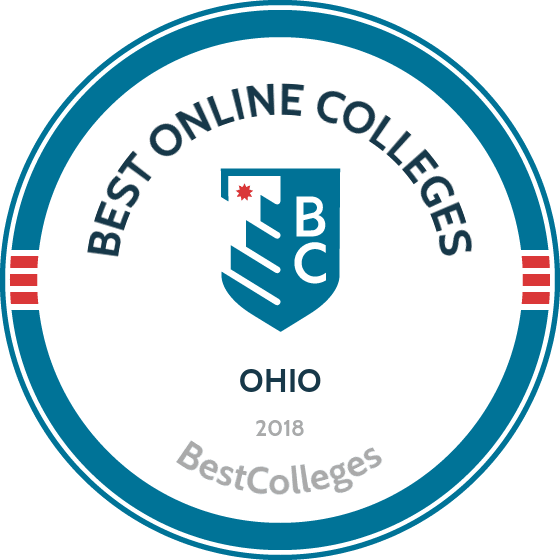 Browse our list of the best online colleges in Ohio for more insight into distance learning programs in this state. According to a 2012 NCES report, 9.6% of students enrolled in Ohio's Title IV institutions were in exclusively online programs. That accounts for just over 70,000 students total. Schools in Ohio offer a few educational benefits that help students get the most out of school. The state government facilitates a collaborative eTutoring program, free for students and schools. Not every school participates, but students using the program have access to remote tutoring services. Using chat room software, document sharing and an online whiteboard, students can connect with tutors and share their homework, assignments and essays. Audio and video software enables students to speak with tutors in real time; students can also post questions in an online discussion box designated for topics that don't require an immediate response. Additionally, Ohio recently began a project called Program Share, which permits students within the Ohio University system to enroll in online classes offered at schools throughout the system. This provides students access to more courses than ever before and gives distance learners more flexibility to tailor their class schedules. Employment growth in this profession in Ohio is strong. According to the Ohio Department of Job and Family Services, long term projections show an increase of 16% in the total number of jobs relevant to this field between 2014 and 2024. Wages increased by 4% among degree-related careers from 2011-2016. In Ohio, what were the top careers in 2016 for people who had a degree in registered nursing? Data source: Ohio Department of Job and Family Services, Bureau of Labor Statistics. Data may not be available for every year. Employment growth in this profession in Ohio is moderate. According to the Ohio Department of Job and Family Services, long term projections show an increase of 5% in the total number of jobs between 2014 and 2024. Wages increased by 1% among degree-related careers from 2011-2016. In Ohio, what were the top careers in 2016 for people who had a degree in business administration and management? Employment growth in this profession in Ohio is strong. According to the Ohio Department of Job and Family Services, long term projections show a increase of 22% in the total number of jobs relevant to this field between 2014 and 2024. Wages increased by 13% among degree-related careers from 2011-2016. In Ohio, what were the top careers in 2016 for people who had a degree in health/health care administration/management? Employment growth in this profession in Ohio is strong. According to the Ohio Department of Job and Family Services, long term projections show an increase of 170% in the total number of jobs between 2014 and 2024. Wages increased by 4% among degree-related careers from 2011-2016. In Ohio, what were the top careers in 2016 for people who had a degree in criminal justice/law enforcement administration? Employment growth in this profession in Ohio is strong. According to the Ohio Department of Job and Family Services, long term projections show an increase of 19% in the total number of jobs relevant to this field between 2014 and 2024. Wages increased by 7% from 2011-2016. In Ohio, what were the top careers in 2016 for people who had a degree in accounting?